Catsass was developed by a French illustrator. Catsass is sassy. 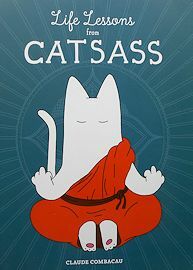 The book contains Catsass comics, tips on how to live a catsass style, exercise, games, quizzes and more. Catsass can be found on Facebook. Copyright 2017, paperback, 159 pages. The book is 7" wide x 9" high. New.